It’s hard not to feel a wee bit jealous of Nysos Vasilopoulos. The 34-year-old photographer has already had a number of solo exhibitions in Berlin, which he calls home for the past seven years, collaborated with dance and theater troupes there and in Athens, even worked on a short film that has been screened at the International Short Film Festival in Drama. So it comes a bit as a surprise that, when it comes to taking pictures, his main passion and craft, this independent and talented young man has chosen to focus on the more poignant aspects of the human psyche. Melancholy, loneliness and introversion are the words mostly associated with the work of Patra-born Vasilopoulos, whose work has already drawn comparisons to that of Michael Ackerman. “Street Sonnets,” an exhibition of 57 black-and-white photographs shot in Berlin and other European capitals between 2002 and 2009, is currently on show at the Photography Museum of Thessaloniki. Athens Plus met with Vasilopoulos at the premises of this seaside, cozy industrial building. As a photographer you bear the label of “melancholy” and “loneliness.” Is it something that has been imposed on you, or is it something that you’ve tried to bring out with your work? No, it’s not something that has been imposed on me. Rather, it’s a statement that I myself have used. In recent years, I have been searching for man’s loneliness, introversion and isolation. Whether I found myself in Athens, Berlin, London or Paris I was searching for man. Not in fancy parties, colors and lights but rather in places where we all exist in our daily lives. In some way, it was a reflection of my own thoughts and feelings about modern man, the modern Western man. Was it man’s loneliness or solitude? Or, perhaps, both? Does art thrive on melancholy? Yes. I believe art, art at its core, is tough. It won’t pet you, it won’t lie to you. Art is not some big party but something esoteric that we all share. It’s all about who people and how much they work on it. Do these rough urbanscapes give you what you are looking for? After all, shooting in Athens or Berlin is one thing, while shooting in postcard-pretty Paris or Amsterdam is quite another. I see what you mean but if you are looking for man you will find man regardless where you may be. A lonely setting can be found in any city. In any western city you’ll always find a coffee-place with a man sitting in a moment of silence, just like my photograph at the El Prado foyer. Funny thing is, this man was joined by three ladies right after I clicked. In a way, that is the illusion of photography. The photographer captures the moment. What happens before or after that moment is a whole different story. Is photography melancholy by nature? I mean the way it captures the moment that is forever lost. I think so. You freeze time and you pass it into the future; it’s an illusion. But there is also something melancholy about trying to freeze reality. Some of your photos appear to have been staged. Yes, I do stage some of them. When I was younger, I used to say: “Yes, this is a very beautiful photograph but it is staged, so I don’t like it.” With time you realize that this does not matter, because you can stage something or you can have something completely spontaneous and still get the same power. The point is to transcend form and create something that will stand in time. 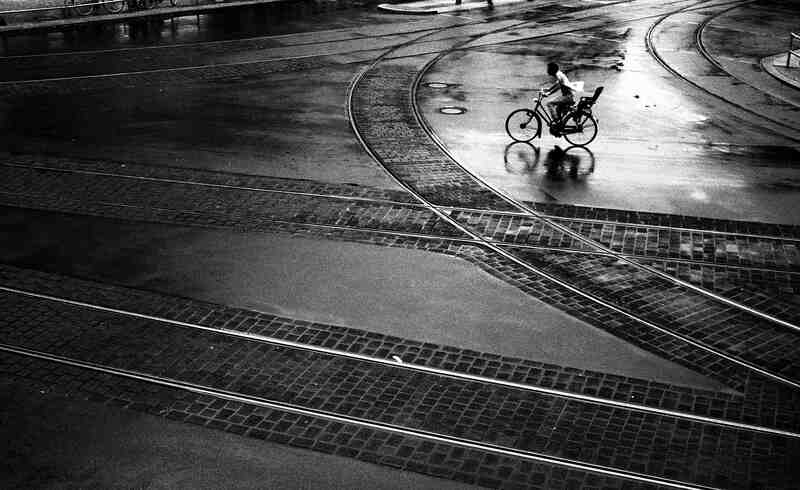 Yes, I have delved into the work of [Henri] Cartier-Bresson and [Andre] Kertesz. You have shot thousands of pictures. How can you tell a really good photograph from a not-so-good one? My criterion is if a photograph that I shot in 2002 still does it for me today. A good photograph is one that can stand the test of time. But it’s also about you, what you want to say. Sometimes you may use a photograph to test your own doubt toward it. I am not so sure about all these photographs [on display here]. I still have doubts about some of them. What is your favorite photo in this exhibition? I really like the one at the Louvre statues. It gives me a melancholic feeling. These statues were made to stand under the sun and we wrapped them in plastic and placed them one next to the other; they look haunted. It’s like people who have lost their freedom. You have lived in Berlin for the past seven years. Have you ever thought of coming back? I don’t feel like a migrant. I mean, I can be here and be in Berlin or anywhere else at the same time. I love Berlin; it’s my base, my daily life. That does not mean to stay I plan to live there forever. Just like I got on a plane and left, the same could one day happen again, this time to another destination. Nysos Vasilopoulos studied photography, journalism and history of European civilization in Athens before moving to Berlin, where he studied film direction at the Berlin Kaskeline Filmakademie. He has experienced with other art forms and collaborated with sculptor Clavie Duson, musician Chris Jarrett and poet Ernesto Estrella.